We’d love your help. Let us know what’s wrong with this preview of Death of a Modern King by Angela Pepper. Book 4 in the hot, new cozy series fans are buzzing about! Each book in the STORMY DAY MYSTERY series may be read as a stand-alone novel. Book 4: A suspicious death at the Koenig Estate has everyone talking. Stormy Day was there when Book 4 in the hot, new cozy series fans are buzzing about! Each book in the STORMY DAY MYSTERY series may be read as a stand-alone novel. To ask other readers questions about Death of a Modern King, please sign up. I just love Stormy Day and her dad, Finnegan Day. they make a great team. Logan Sanderson is a great tenant and new boyfriend. I was really happy in the last book that they decided to try dating. Stormy's roommate is Jessica and then there is the little gray cat Jeffrey. There are other drop in people from the last book, so I really felt like I was a part of the collective. The death was not even being considered murder until Stormy made noises to the pol What a delightful cozy mystery this was. I didn't enjoy this one as much as the others but I did enjoy none the less. I felt like this book left some things open that I hope will be wrapped up in the next book. I cannot wait for the next one & this one is not really out yet! Thanks Angela for another good book. Please kee Excellent! I liked Stormy back in her town and solving crimes. She and Dimples made a good team for this one. The writing was great like always and the mysteries as entertaining as ever. I will say that I wasn’t that thrilled with some of the relationship matters between Stormy and Logan, he’s not very nice sometimes. This book was just so-so...it held my attention, but there were times when I caught myself wondering when it was going to be over. I like most of the characters and especially enjoy the quirkiness of the friendships. Not a fan of Della, but she has her place, and she's not all bad. When are we going to meet Sunny Day??? Angela Pepper continues to produce a fast paced mystery while also adding depth and texture to her characters. Stormy, Jessica and Logan all gain some facets while solving a convoluted crime and some old friends pop up. These are really fun reads, with characters you'll like and enough twists to hold your interest. A will is to be read, after a death in the family. Heirs and heiresses are coming out of the woodwork, but is it a death,or a murder? Too many suspects, too many clues. And surprises for everyone, especially Stormy Day! Another addictive instalment for you to get your teeth into. Highly recommended reading. What an adventure this was with Stormy! I had my suspicions but the plot made me wonder. I like the quirky way Stormy gets involved in mysteries and her laid-back manner of solving them. Onward to #5! Really enjoyed getting to know all of the characters in this series. Looking forward to the next installment. Interesting story. So far none are as good as the first but they are different enough to keep from being obvious with enough red herrings. Good story. Fun, and keeps you guessing. I truly enjoyed reading this book. I was giggling through most of it, as I puzzled over the mystery. This is a great series. By far one of the best in the series.. many quirky moments of the "Day" had me in splits. The plotline, story development was so good that, I'll admit this time, i couldn't guess the killer! The author really stepped up her game in her riveting mystery :) Best book in the series so far! The fourth book in the Stormy Day Mystery series Death of a Modern King does not disappoint. Each book is entertaining and fun. This was probably my second favourite in the series. A nice light read and with a lot of humour and quirkiness which makes it a really fun read. She does, however, have an incredible talent for being at the wrong place at the wrong time. Or maybe it's the right place. I don't know. What I do know is that dead bodies are practically falling into her lap, demanding she extract CRUEL VENGEANCE FOR THEIR UNTIMELY DEMISES! No, wait. That's not quite right. What she does is unearths the secrets behind how the stiff ended up, well... stiff. I mean, she might get in a tangle or two with a billboard while doing it, but she LEARNS something from that tangle. Kinda. And then she uses the skills her pops instilled her with to ferret out the secrets of the town. Also, she unearths a hidden bunker. Which is all sorts of fun for everyone. Stormy is quirky and fun and she's certainly grown into the role she took on after finding that first body. She has a steady man (one who has a mystery or two lingering about him, it seems) and plenty of friends to lean on when the situation gets sticky. The only thing I worry about with her is who's going to end up dead next. If you enjoy cozy mysteries then you need to experience Stormy Day. This is her forth book and having read all in the series, I do believe this one is the best story yet. Stormy Day is a small business owner in the small town of Misty Falls Oregon. She shares a duplex with her boyfriend/lawyer Logan and with her feline companion Jeffrey and Stormy's roommate Harper. Stormy's father Finnegan Day is a retired police officer who taught his daughter everything he knows about the law and catching cri If you enjoy cozy mysteries then you need to experience Stormy Day. This is her forth book and having read all in the series, I do believe this one is the best story yet. Stormy Day is a small business owner in the small town of Misty Falls Oregon. She shares a duplex with her boyfriend/lawyer Logan and with her feline companion Jeffrey and Stormy's roommate Harper. Stormy's father Finnegan Day is a retired police officer who taught his daughter everything he knows about the law and catching criminals. Stormy's curiousity leads her into some scary and funny situations as she works with Logan to research the whole story of his clients. Some of the characters who make an appearance in this story, have also been in the earlier books. But you don't need to read them all to be able to enjoy and understand this one. "I pointed to the sink. "We'll go, but get out your little notepad and write this down. Have the CSI techs pull prints and DNA from these tumblers and the bottle. Oh, and Logan saw someone, possibly a gardener, leaving the pool area when we arrived on the scene." "I rested my head against his chest, inhaling deeply. His jog around the mansion and to the hangar had made him sweat, and the musky scent was as comforting as his solid body against mine." "You really surprise me sometimes. You stumble across dead bodies and interrogate killers, but I make a few terrible word choices, and this happens." This book had everything I love in a book; love, humour, mystery, cats and lots of good soul food. The Author gifted this book for an honest review. I have really enjoyed this series. And the stories just keep getting better. In this book, Stormy and her boyfriend Logan are invited to breakfast in the home of a powerful man in Misty Falls. But when they get there, they encounter a murder scene. As the story progresses, we see Stormy try to solve the crime with every new information that she receives and/or seeks out. There are many twists and turns that I did not see coming. I was highly entertained and couldn’t wait to find out what will ha I have really enjoyed this series. And the stories just keep getting better. In this book, Stormy and her boyfriend Logan are invited to breakfast in the home of a powerful man in Misty Falls. But when they get there, they encounter a murder scene. As the story progresses, we see Stormy try to solve the crime with every new information that she receives and/or seeks out. There are many twists and turns that I did not see coming. I was highly entertained and couldn’t wait to find out what will happen next. Such humor and mystery and love packed into a great series. These characters and plots are fantastic and very enjoyable. A great read. 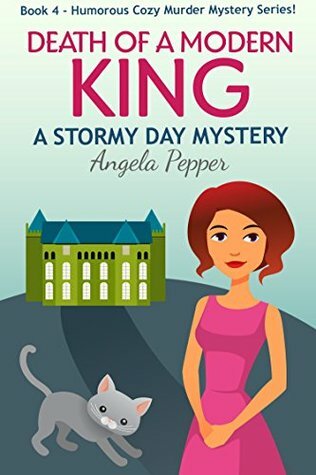 Death of a Modern King is #4 in Angela Pepper's Stormy Day Series. The characters in this book are well developed. I feel like they could be my next door neighbors. Stormy is very likeable. She trying so very hard to be a detective She is very good but most people don't believe in female sleuts until she actually solves the crime. Stormy kept me guessing who done it to the very end. Angela is a great writer. Her books are fun light easy reads. 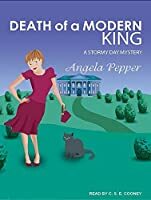 I highly reecommend this light, fun fast paced book Death of a Modern King is #4 in Angela Pepper's Stormy Day Series. The characters in this book are well developed. I feel like they could be my next door neighbors. Stormy is very likeable. She trying so very hard to be a detective She is very good but most people don't believe in female sleuts until she actually solves the crime. Stormy kept me guessing who done it to the very end. Angela is a great writer. Her books are fun light easy reads. I highly reecommend this light, fun fast paced book and all the STormy Day Series. I look forward to the next book in this series. Another excellent Stormy Day mystery. Angela Pepper is so good at creating characters that I care about and commiserate with and laugh at (or with). Stormy and her roommate Jessica feel like friends and next door neighbors. I get everything about Jeffery and see so much of my own pets in his every mannerism. The mysteries are complex and intriguing. I enjoy this series so very much that it is hard to wait for the next book. Stormy Day, despite her name, is really a breath of fresh air! She is smart, observant, very competent, but most of all has a great sense of humor. I just love her interactions with her new boyfriend, Logan (aka: Dr. Feelgreat!) & Officer Dimples (aka Kyle)!!! The story was well written & has just enough suspense & surprises for a cozy mystery. I guess it can be read by itself but you get so much more if you read the entire series. This author stands right beside K.P.Morgan with writing a page turning story. She leaves you on until the end to find the murderer. I loved all these books. Misty Falls and the characters come to life under the storylines of Angela Pepper. I sure hope she pins another book to carry on Stormy Day and friends. Great story with lots of laughs. Another funny and wild adventure for our favorite almost private detective Stormy Day. Stormy finds herself in the middle of another mystery in her hometown. Who is the right heir to the "Kings" fortune after his suspicious death. Keeps you guessing and laughing til the end. Another entertaining book by Angela Pepper. Nice to have both previous and new characters romping through the pages. Now we have to wait for the next installment. 20 more words are required. Too bad I can't just do a review using stars. It is easier if I don't like a book. Note-I received an advanced readers copy in exchange for an honest review. Death of a Modern King is my favourite so far. This is a series that just keeps getting better. I really love how Stormy's sleuthing skills grow with each new book. This one really kept me guessing right up the very end.